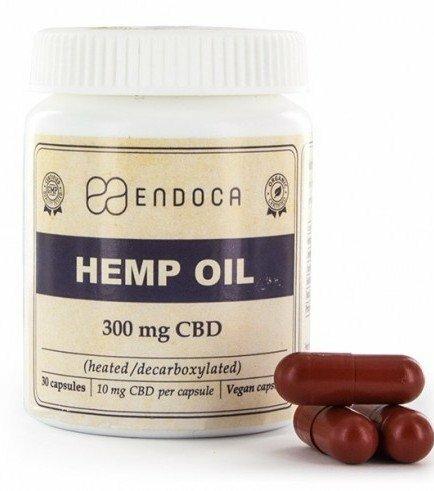 The Endoca Hemp Oil Capsules are great for all you CBD enthusiasts. The container holds 30 capsules, which contain 10mg of CBD each, so the container holds 300mg of CBD in total. The capsules are made from vegan gel, which is tasteless and odorless. The capsules are easy to swallow due to their slippery texture. These capsules are very convenient if one does not like the taste of hemp oil. The hemp oil extract contained in the vegan-gel capsules is made from hemp, grown in Denmark, without the use of herbicides or pesticides. Normally, these capsules are to be used 3 times a day. If you want to see how these capsules effect you, simply start by using small doses and then climbing up to 3 capsules a day. Consumers can have allergic reactions to hemp or marijuana because the plants themselves can host mold, powdery mildew, fungi, pests etc. Endoca's products are made from pure hemp, so no need to worry about unwanted peskiness. Many CBD capsules or hemp oils will have additives to make the flavor “better”, but the chemicals might not be good for the health. Endoca’s hemp oil capsules don’t contain any flavorings, all one receives is pure hemp oil. Endoca’s products have served over 10,000 people without a single incident of an adverse effect or allergies. Although, if you experience any negative effects from the capsules, stop immediately and contact your physician. Pregnant women and children under the age of 5 should not consume these capsules. Terpenes: Limonene, Linalool, Myrcene, Alpha- & Beta-pinene, Terpinolene, ß-caryophyllene, Caryophyllene oxide, and Humulene. Phytocannabinoids: CBD and trace amounts of CBC, CBG and CBN. The capsules also contain other natural molecules such as: Alkanes, Amino acids, Nitrogenous compounds, Sugars, Aldehydes, Alcohols, Ketones, Flavonoids, Glycosides, Vitamins, Hemp seed oil, Pigments, and Water.